Recently the trending topic of Bollywood is the upcoming movie Zero of Shahrukh Khan, newlywed Anushka Sharma, Katrina Kaif. Shahrukh is playing the role of a dwarf in the movie and it is said that the movie will be released in December 2018. Shooting has been started and the first look of the Shahrukh Khan has been revealed on YouTube on 1 January. Shahrukh Khan is planning to release the movie on Christmas, swapping it with Aamir as he generally releases his movie on Christmas. 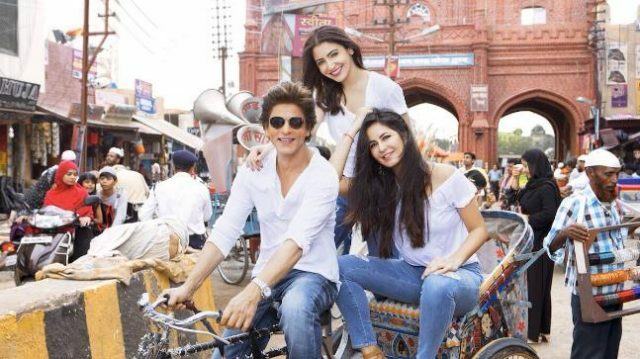 The cast is having a great time together and this selfie in which Shahrukh is pulling cycle rickshaw for Anushka and Katrina Kaif defines fun in itself. We will show you the selfie which was currently posted by King Khan on Twitter. Shahrukh Khan is pulling Rickshaw for two pretty ladies, Anushka Sharma and Katrina Kaif. They are looking good together and having a great time. This pose is hitting social media and getting shared by many fans. Shahrukh also added to the movie that he is playing the role of a dwarf and he said that if a person is not physically perfect then he has to face many problems in life. “We should know there is happiness abound in their lives. We don’t have to empathise or sympathise with them, we just need to celebrate them like completely abled people. We should never distinguish between them.” These words are really motivating and we get to know why Shahrukh is known as King of Hearts. He said that we will give small tidbits to the viewers every month till the Zero is released. He launched his look in January but the look of Katrina Kaif and Anushka Sharma id hidden. He has some plans for Holi and we will get to see what new Shahrukh will launch in February. Irrfan Khan fights cancer :But he looks positive towards this.